Here is your chance to own the most famous literary bird of all time, the Haunted Studios Original Maltese Falcon offered here in lightweight, super strong. Ours is the original and authentic. Copied and resold by dozens of other dealers. And collectors for over 50 plus years. We are the authentic, original source since 1963. Make no mistake, this is no amateur made sculpture or interpretation, this is an authentic casting of a motion picture hand prop that had been in use for over 20 years when we acquired it in 1963. This resin cast Maltese Falcon is guaranteed against chips, breaks, or damage for the lifetime of the original purchaser. No plaster or stone cast Falcon can offer this guarantee. This is truly a gift that will last a lifetime. Our Original Maltese Falcon is featured exclusively in the documentary from Warner Brothers. The Maltese Falcon: One Magnificent Bird. Producers Leva Filmworks picked our Falcon to star as the famous black bird in their 2006 production, part of a three disk Special Edition Maltese Falcon DVD set from Warner Entertainment. For this production our Original Falcon was chosen as the. Beware of imitations and recasts. Recasts tend to be'thick' or'squashed' around the neck and flared at the base. Inferior castings have a deep "V" groove on the back of the head as a result of inferior mold design. We are the originals, we have been doing this for over 50 years and have seen our Original Falcon castings copied more times that we care to remember. Ells its Original Maltese Falcon. Maltese Falcon is an investment in a collectible you will display for years with pride. 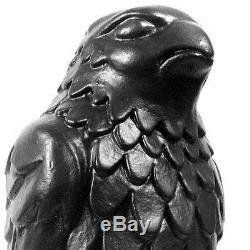 Haunted Studios Original Maltese Falcon Prop Replica Exclusive Features. UltraResin our exclusive blend of Urethane Resin and encapsulated void fillers for a life time of display. Our Original Maltese Falcon is not just painted, but is cast in black Polyurethane Resin with a special protective clear top coat and may be safely displayed indoors or out. Falcon comes with a Gold Sealed Certificate of Authenticity and Legend of The Maltese Falcon that looks great framed [SEE PHOTO AT LEFT] and traces the "known history" of the bird from its creation in 1539 to its place in your collection today, and certifies you as the original owner. A unique collectors package, this Maltese Falcon set of. The original casting plus COA. Makes a great addition to any collection. The COA is 8 1/2" x 11" and. Comes affixed with The Haunted Studios. Our original castings are on display in Museums, Motion Picture, Television, and Radio Studios around the world. Full details and return instructions are below. No elements of this Advertisement may be used or linked to in any manner without prior permission. The Haunted Studios, Haunted Studios Collection, Studio 303, and The Haunted Studios Group Trade Marks are the exclusive property of Ken Patterson. All other Names, Trade Marks, and Copyrighted Images are referenced here only for identification purposes with no rights of ownership given or implied. Any unauthorized reproduction of this item or any element of this advertisement is strictly prohibited may subject you to civil or criminal liability. All information contained herein is accurate to the best of our knowledge at time of publication. Ours is a private collection, owned by an individual, and everything offered for sale is strictly from collector to collector. The item "Maltese Falcon Statue Prop Haunted Studios RESIN CASTING ORIGINAL 1963 SOURCE" is in sale since Monday, January 08, 2018. This item is in the category "Entertainment Memorabilia\Movie Memorabilia\Props\Reproductions". The seller is "the-haunted-studios" and is located in Clearlake, California. This item can be shipped worldwide.